Water is essential to survival, revered and respected worldwide for its power, creative and curative abilities. Wai, water or flow is central to the worldviews of many indigenous cultures of Earth, and is of special significance to tangata whenua (the people of the land) of Aotearoa New Zealand. The scientific study of water and the onset of turbulence was central to the development of Chaos Theory. Today water monitoring in the environment has become important to sustainable approaches to water management. Water as a resource has become intensely politicised and monetised, in contrast to the view that access to fresh water is a fundamental human right. Peace is also essential to the sustainability of humans on Earth. SCANZ2015:water*peace brings together people from diverse backgrounds,connecting everyone in a positive expression of our relationship with water and the power of peace. Water*peace begins on the with noho marae (overnight stay) at Parihaka in Taranaki, Aotearoa New Zealand. The 18th and 19th of each month are special days of the celebration of Te Whiti and Tohu, prophets of peace in colonial times. They were leaders during an infamous episode of New Zealand’s history, and Parihaka is today world renowned for the stance on peaceful protest in the face armed constabulary. On the afternoon of the 19th, SCANZ participants will return to Nga Motu New Plymouth where they will stay and work on the campus of the Western Institute of Technology at Taranaki. Over a two week period they will collaborate, work with visit and be visited by locals, conduct workshops and create works and projects to be exhibited on the banks of the Huatoki River walkway. There will be a public activity day, viewing of the installations and night time projections in Huatoki Plaza. 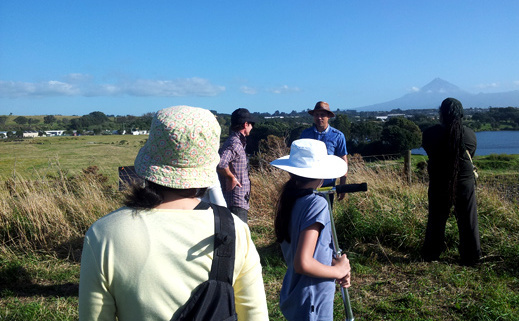 A walking symposium on the final day will follow the path of the works along the Huatoki up to Pukekura Park. Saturday January 17th – participants arrive in Nga Motu New Plymouth. There is a welcoming on to the WITT campus. Sunday January 18th – travel to Parihaka (depart 8am). Overnight stay at Parihaka. Group discussion in the evening with residents of Parihaka. Monday January 19th – mid to late afternoon return to New Plymouth. Tuesday January 20th – morning – first presentation by invited guests (likely to be a tangata whenua group). Wednesday January 21st – morning – second presentation ( local electronics specialist Andrew Hornblow). Thursday January 22nd – morning – third local presentation (environmental group). Friday January 23rd – morning – fourth local presentation (likely to be a raranga/weaving session, may involve travel). Saturday January 24th – day is open to explore Taranaki, do project work, take part in spontaneous collaboration or take a beach, coastal or mountain walk. 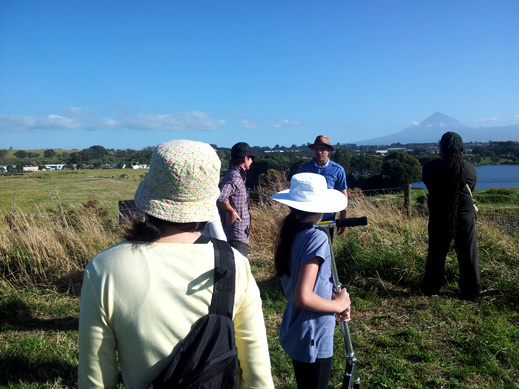 Sunday January 25th – day is open to explore Taranaki, do project work, take part in spontaneous collaboration or take a beach, coastal or mountain walk. Monday January 26th to Friday January 30th – working on projects / collaboration / testing / installation / preparation for weekend presentation. 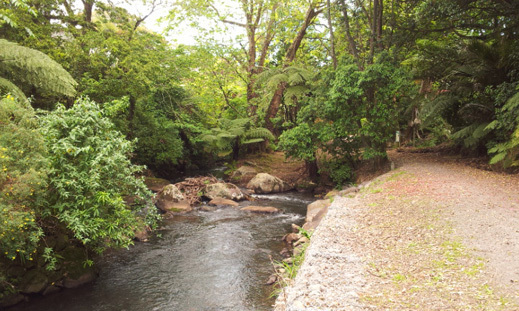 Saturday January 31st – Day of installation of projects along Huatoki walkway and or Pukekura Park. This is also the public activity day in Huatoki Plaza. All applicable projects presented in the Plaza. Night time projections either in Huatoki Plaza or Pukekura Park. Sunday February 1st – commence hui / walking symposium at 9am along the Huatoki walkway. Poroporoaki / reflections on the residency in the late afternoon. Monday February 2nd – participants depart accommodation for outward bound travel. Please note the above schedule may change and is subject to confirmation by appropriate organisations and individuals. 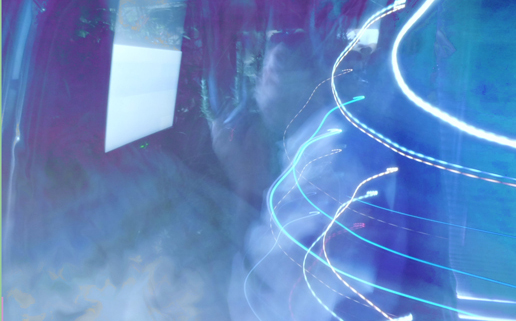 Intercreate is commissioning two innovative art works, to be realised in 2014. 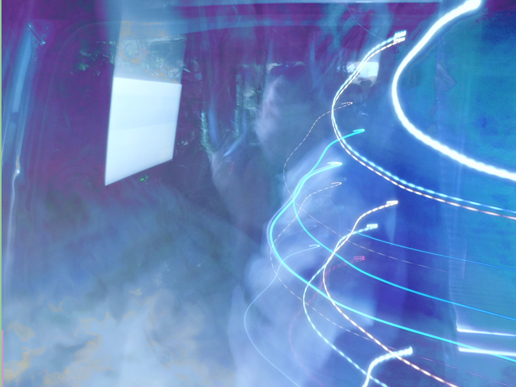 The Media Art Projects aim to inspire artists and creative teams to think boldly about combinations of cultural ideas and contemporary media technologies, that could be implemented in public space and/or Pukekura Park. These projects are open to Aotearoa New Zealand artists here and abroad. Shaman Don Patricio in the ‘Car Garden’, Albuquerque. Being Light: a festival of light and ideas explores ideas about light across Maori, Navajo, Mayan, Pueblo and Western European culture. The festival has two parts, activities in the day with stalls and market; while in the night there are outdoor projections on the side of buildings. Attendance is free. We live in a time where there is great interest in bringing together indigenous and Western cultures, art, science and technology. Currently involved are: Patricio Dominguez, Ian Clothier, Mike Andrews, Mike Sutherland, Issa Malluf, Agnes Chavez, Tom Greenbaum, Jamila Colozzi, Courtni Hale, Glenn Parry, Enrique Hynes, Julia Pyatt, Sandra Wasko-Flood and Susan Caffrey. Te Huirangi Waikerepuru, Te Urutahi Waikerepuru (of Aotearoa New Zealand), Will Wilson and Richard Lowenstein have expressed interest. We are in contact with Santa Clara Pueblo and have invited Mayan participation. Te Hunga Wai Tapu consists of: Dr Te Huirangi Waikerepuru, Te Urutahi Waikerepuru, Ian Clothier, Jo Tito, Craig Macdonald, Julian Priest, Sharmila Samant, Leon Cmielewski, Josephine Starrs, Andrew Hornblow, Darren Robert Terama Ward, Johnson Dennison, Andrew Thomas, Dugal McKinnon, Sophie Jerram and Gordon Bronitsky. Aerial imagery courtesy of Land Information New Zealand. There are five components to the Wai project. 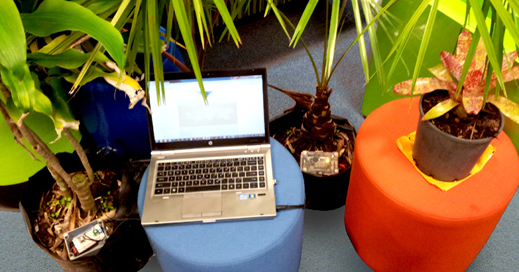 Te Iarere (communication across vast distances) involves data from a tree in Opunake, New Zealand Aotearoa. Tree voltage, temperature and light are measured. The live data readings control audio played in the exhibition space. Ian Clothier conceived and directed Te Iarere. Andrew Hornblow made the custom data sensors. Julian Priest and Adrian Soundy created the web interface. Darren Robert Terama Ward is a Maori musician who plays self made traditional instruments and Andrew Thomas is a Navajo musician specialising in the flute. The second component is Pou Hihiri (the womb of the universe). The Pou is encapsulated in vinyl graphics, contains woven LED’s and has an audio component. Conceived and directed by Te Urutahi Waikerepuru, Craig Macdonald made the Pou graphics and structure with audio by Dugal McKinnon and Sophie Jerram. Video is the third component. Indian video artist Sharmila Samant has contributed The Wasteland, an exploration of Wai in New Zealand. The Maori expression for ‘Who are you?’ is ‘Ko wai au’ which literally means ‘of whose water are you’ and is understood by Maori to mean ‘of whose ancestors are you?’ Jo Tito, a contemporary Maori artist currently studying science has made two videos of Wai, which play inbetween The Wasteland and Ruamoko. Ruamoko is made by the Institute of Geological and Nuclear Sciences in New Zealand Aotearoa, and explores both Maori and Western scientific views of earthquakes and volcanoes, the result of of flow phenomena in the Earth. Julian Priest contributed Sink a model of anthropogenic ocean acidification. A conceptual work, carbon dioxide exhaust gasses are piped into a tank containing brine. Carbonic acid is formed, increasing acidity, which dissolves a scallop shell in the tank. The fifth component is an animation and audio work by Leon Cmielewski and Josephine Starrs Puwai Rangi Papa. Projected onto the floor, the words of Te Huirangi Waikerepuru are etched into the mountain landscape of his home – Taranaki Maunga (mountain). Andrew Hornblow is an inventor, engineer and National Moderator for ETITO, an industry training organisation for the electrotechnology and telecommunications industries. It is a standards setting body whose goal is to ensure that enough skilled people are available to work in these industries. ETITO began the Bright Sparks programme more than 10 years ago to foster the skills of young people who are keen on technology. Through a website, an online forum, one-on-one mentoring and qualifications in schools, the Bright Sparks programme has unleashed the genius and creativity of hundreds of talented young people. Andrew Hornblow tours the country giving electronics workshops as part of Bright Sparks. ETITO created Bright Sparks in 2000 to nurture those students who will be our nation’s future engineers, electricians and programmers. At its core, Bright Sparks is about bringing together people with an interest in technology so they can exchange ideas and information, and give encouragement to those who are just strating out. It’s also about getting young people to experience electronics directly through a project-based approach. Hornblow has also provided customised – built from the ground up including the circuit board – electronics for creative projects Te Iarere, The Park Speaks, Taranaki Fence, and Haiku robots. 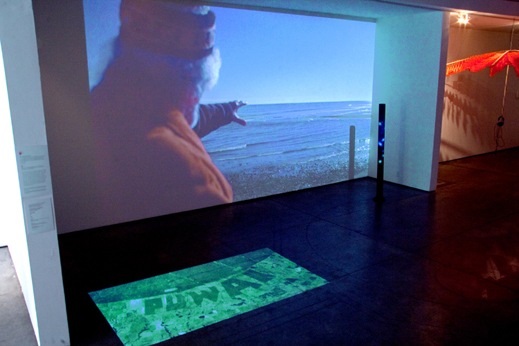 Leon Cmielewski and Josephine Starrs (http://lx.sysx.org) are artists whose long-term collaboration has produced a variety of screen-based installations. Their recent media artworks are situated at the juncture of cinema, information visualisation, and data mapping, playing off the tensions between the large and small screen, and between information and sublime landscape. Cmielewski is a Design Lecturer at the School of Humanities and Communication Arts at the University of Western Sydney. Starrs is a Senior Lecturer and Chair of Film and Digital Art at Sydney College of the Arts, Sydney of University. 2011 Incompatible Elements, Auckland Festival of Arts, MIC | Toi Rerehiko, Auckland,NZ. 2010 Incompatible Elements, Performance Space, Carriageworks, Sydney. 2010 Land[sound]scape installation, Chinese Garden of Friendship, Sydney. 2007 Plaything installation, Sydney College of the Arts. 2007 Seeker installation, Artspace, Sydney, NSW. 2006 Seeker installation, Experimental Art Foundation, Adelaide, S.A.
2002 Dream Kitchen, interactive animation, Institute of Modern Art, Brisbane. 2012 Wonderland, New Contemporary Art from Australia, Museum of Contemporary Art, Taipei, Taiwan. 2011 Waterways, Urbanition, SFAC Gallery, San Francisco, USA. 2011 Waterways, Urbanition, Carriageworks, Sydney. 2011 a.k.a Utopia Now, MONA, Hobart, Tasmania. 2011 Kitchen Carnage<<<(((Mods&Hackers)))>>> Game Modification, Hacking,Patching, and Code-Based Practices within Contemporary Art, YoungProjects, Los Angeles, USA. 2010 Encoded, Art Taipei 2010, Taiwan. 2010 a.k.a Utopia Now Experimenta Media Art Biennale, Melbourne. 2009 sms origins, Big Screen project, Federation Square, Melbourne. 2008 Land[sound]scape installation. Guangzhou Triennial, Guangzhou, China. 2007 Seeker installation, Ars Electronica, Linz, Austria. 2006 Seeker installation, Contemporary Commonwealth 06, ACMI Melbourne Vic. 2005 In the Line of Flight, Beijing, China. Floating Territories installation. 2004 Media_city Seoul 2004, Bio-Tek Kitchen, computer game modification. 2004 ISEA2004, Finland. Floating Territories installation. 2003 Bio-Tek Kitchen, House of Tomorrow, Experimenta, Black Box, Melbourne. 2003 Version03, Museum of Contemporary Art, Chicago, Bio-Tek Kitchen. 2002 Trace, installation, Sydney Records Centre, The Rocks, Sydney. 2002 Transmediale Media Arts Festival, Berlin, a.k.a. digital video. 2002 European Media Arts Festival, Osnabrük, Germany a.k.a. digital video. 2002 Contagion, Auckland, New Zealand. a.k.a. digital video. J. Sjaastad ArtRadar Asia interview March 2011. Words in Art: Australian artist Josephine Starrs maps rivers with poetry. J. Hurrell EyeContact, March 2011 Review of Incompatible Elements solo show at the Auckland Arts Festival, New Zealand. Review of Land[sound]scape Chinese Garden of Friendship, Sydney. A. Finegan Artlink Vol 27, no3, 2007 Databases: Recombinant Interactives. Wai opened with a Tomo Whakaari, a dawn ceremony following Maori protocol at 6.53am September 19 at 516 Arts in Albuquerque. We were privileged to have Johnson Dennison, a Navajo Medicine Man contribute some Navajo ceremony. Te Urutahi Waikerepuru, Dine’/Navajo musician Andrew Thomas and his partner, Dr Te Huirangi Waikerepuru, Ian Clothier, Johnson Dennison, Gordon Bronitsky and Rosemary Dennison just before the ceremonies started. Te Urutahi Waikerepuru, Dr Te Huirangi Waikerepuru and Ian Clothier outside 516 Arts. Te Huirangi is just about to start proceedings. This photo was taken just after the ceremonies had ended, however during the Dine’/Navajo portion, everyone was asked to sit, either on chairs or on the floor. Johnson Dennison talked about what his words meant, then chanted a chant suitable to the occasion and recognising the land and the mountains. This was followed by prayer. The entire event was extremely special, particularly for an art work presented as part of an electronic arts event. On the wall is Julian Priests’ “Sink”, with the Cmielewski and Starrs animation on the floor and Sharmila Samant’s piece projected on the wall.